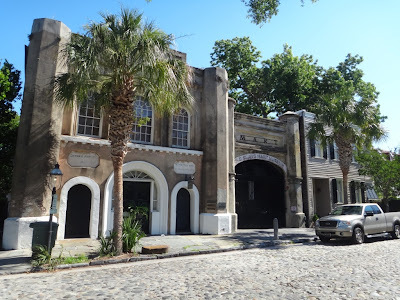 Photograph 1 - The Old Slave Market (now a museum) Charleston, South Carolina. 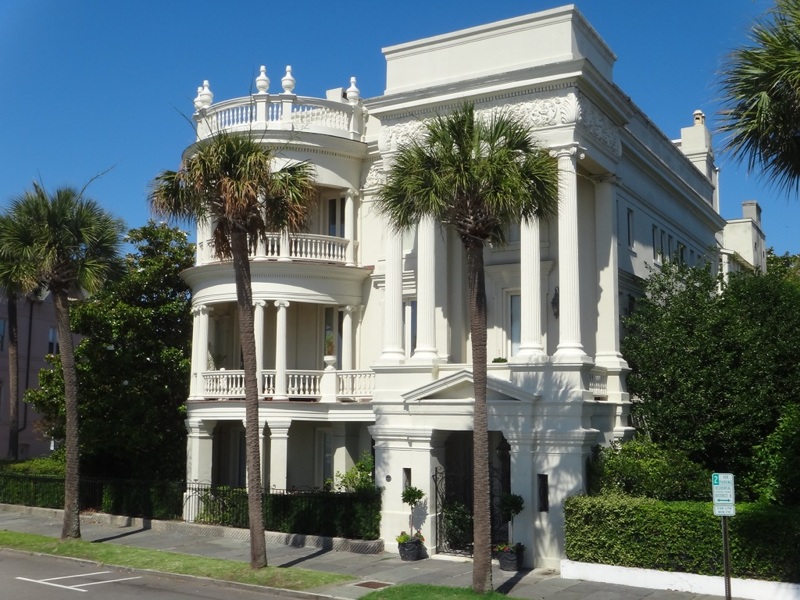 Photograph 2 - An old mansion along Ranbow Row, Charleston. 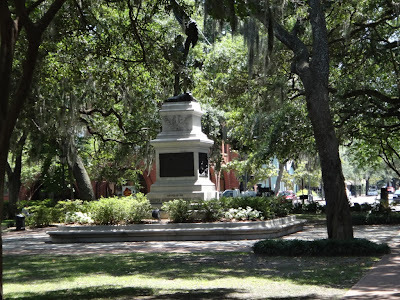 Photograph 3 - One of the remaining 22 Squares in Savannah, Georgia. Note the unusual trees. 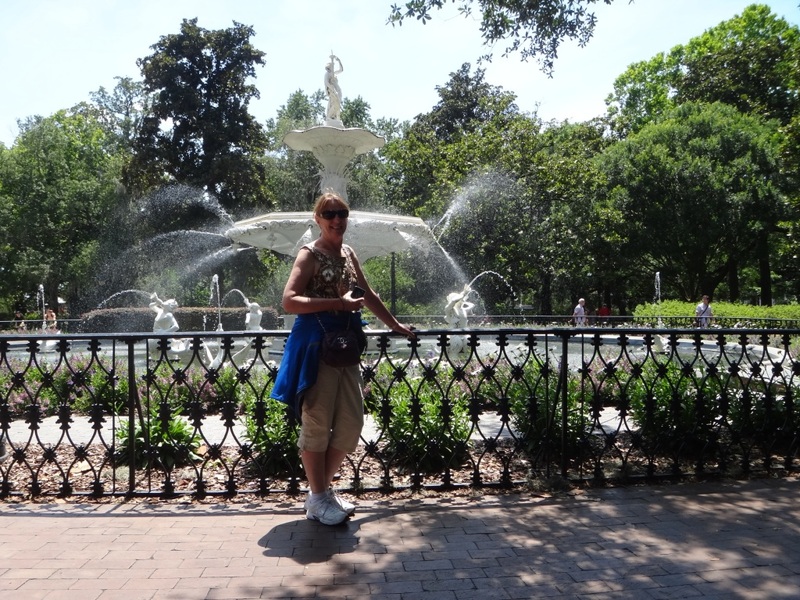 Photograph 4 - Tis Anne in front of a fountain in another picturesque Savannah square. 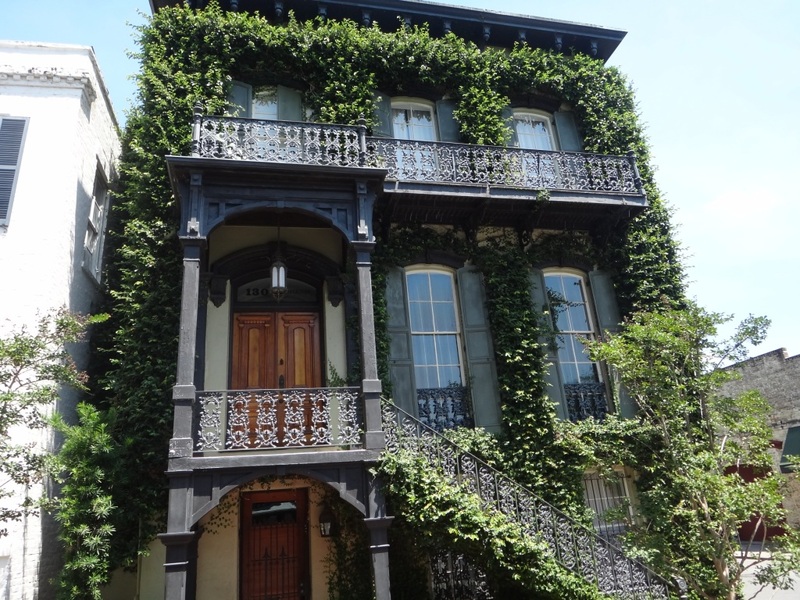 Photograph 5 - How's this for a unique Savannah house? 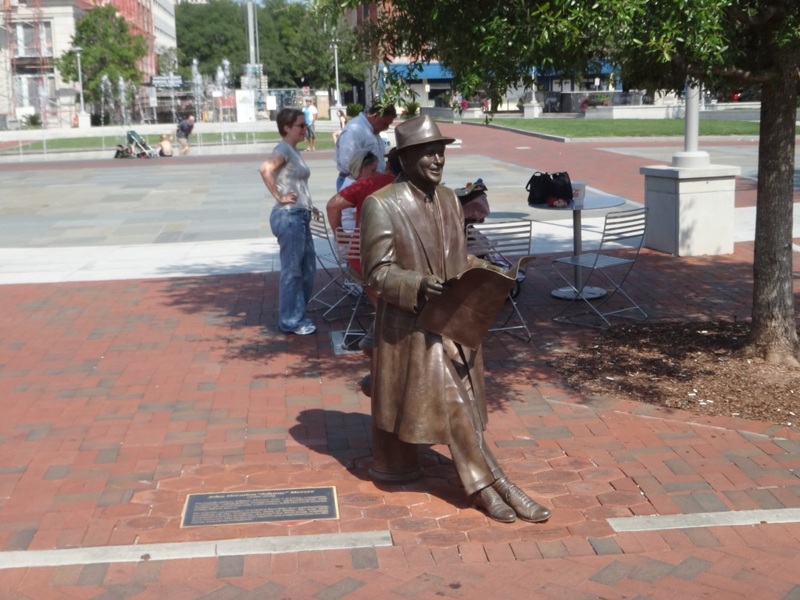 Photograph 6 - A statue of Johnny Mercer - he wrote the music for Moon River and other well known tunes. Located in Savannah, Georgia. 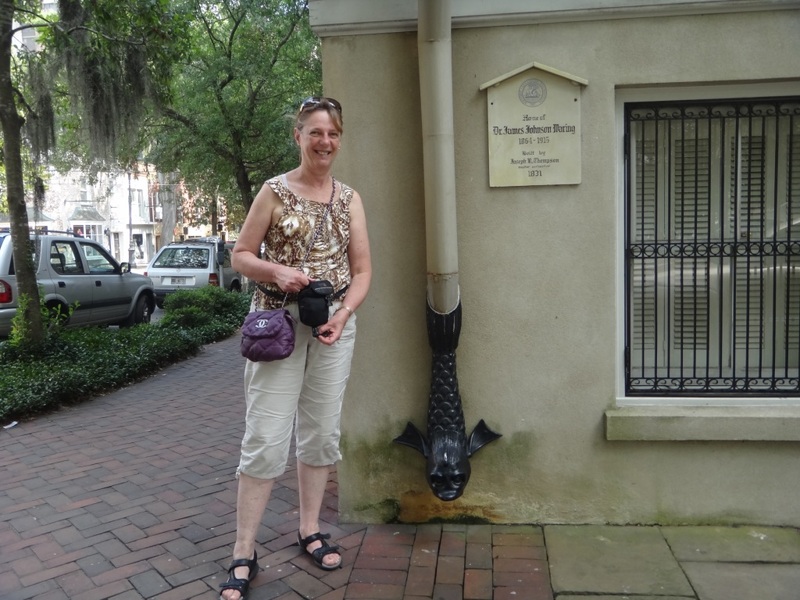 Photograph 7 - What a way to decorate a drain pipe looks fishy? Savannha Georgia. 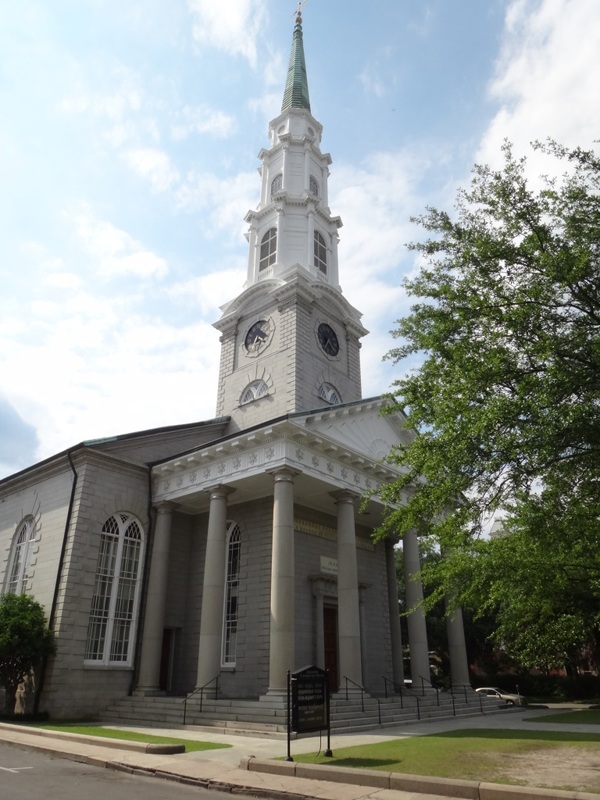 Photograph 8 - The white feather scene that drops from the tall steeple in the movie Forest Gump, Savannah Georgia. Photograph 9 - Ahhhh - Anne along the Savannah waterfront.-------------------------------------------------------------------------------------------------------------------------------------------------------------------------------------------------------------------------------------------------------------------------------------------------------------------------------------- What did we do this morning – we accidently slept in until 9:30am. We had the curtains drawn with no light coming in and no sounds from outside on a Sunday morning and hey it was a recipe to stay in bed. It did not matter today was a 2.5 hour drive to Savannah and an 11am check-out. 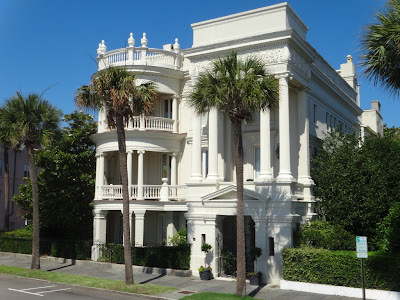 So with the short time we had was a walk around Rainbow Row in Charleston. This is a famous street along the waterfront with 18th century mansions painted different colors to attract photographers and tourist alike. We did stumble upon the old Slave Market where they brought the blacks from Africa during the 1700/1800s and auctioned them off in the building – see the attached picture of the now popular museum. At 11am it was off to Savannah on a fine beautiful day with hardly any traffic on the road. The Mustang performed fantastically and the roads are cambered for enjoyable driving – boy Australia has lots to learn about road design!!! Savannah is a wonderful city – it was hot (not steamy) but really comfortable to walk around. There were 24 squares (small parks) designed back in the 17th century for residences to see a park with a canopy of trees around each property. Today there are still 22 of these squares and are the main attractions. The buildings that surround each park are beautifully arranged to think you are back in those olde days. Only bitumen roads and modern day vehicles spoil the view. Apparently Savannah has been hit with earthquakes, Civil War, tornadoes, hurricanes and two serious city fires – but many buildings survived. We were treated with a great afternoon by a hop-on hop-off trolley with the driver giving us a narrative of different buildings and the story about each individual squares. What are noticeable are the unique trees that are plastered along the streets and more specifically in the squares – as mentioned they are actually parks with statues of famous locals and American heroes. The most indelible story that came from the trolley driver was a white church that he had stopped at. He remarked that picture a white feather falling from the steeple in the beginning of a movie ….. and… the penny dropped…… it was Forest Grump. Yes, we were standing on the spot where Forest Gump aka Tom Hanks reciting his life story to several women waiting at a bus stop. What a “Kodak” moment we experienced!!! So far we have seen Savannah as a great southern city and glad we visited this marvelous place. 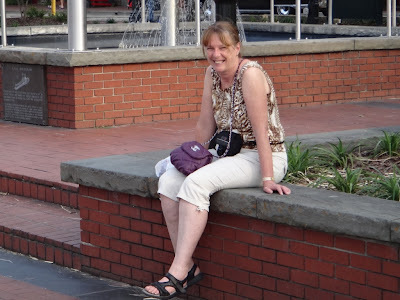 And yes…..the locals do speak with that southern accent…..it’s nice to know-yaah-all!!! We had dinner in a pub that is America’s well known ghost haunt. Apparently there have been murders and all sorts of shenanigans going on in this place over the past centuries. The story goes that busboys and even cooks are afraid of the joint. American ghost hunters have treated this place as the most haunted in all in America. Do we see anything…not really as it was still daylight at 6pm. Tomorrow we off to Blowing Rock in North Carolina – our journey back to Washington DC. Blowing Rock is along the famous Blue Ridge Parkway that supposed to be one of America’s best drives – great for a red Mustang with old Ozzie tourists to appreciate. Cheers.